To keep track of what you have already accomplished, clean from the top down, dusting and washing ceiling fans, light fixtures and corners first. 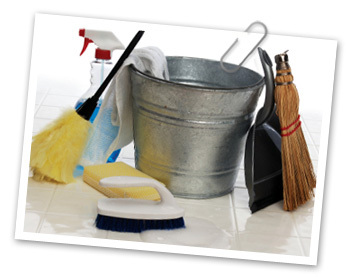 Then wipe and wash walls, windows, counters, furniture and floors. A similar philosophy works with windows. Try cleaning the inside from left to right and the outside from the top down. This will make it easier to tell which side has streaks, if either. Don't forget the outside of the house. Use a power sprayer to remove grime, empty wasps' nests and spider webs from exterior walls and windows. Spray down the garage floor while you are at it to rid the space of fluid leaks and road salt or sand that can easily be tracked inside and stain your carpet. Remove lawn furniture from your basement, garage or self storage unit. Clean it. A good spraying with the hose will usually do the trick. Replace the furniture with snow blowers, snow shovels and winter toys like sleds and snowboards. These bulky items can get in the way when stored at home. As these seasonal items don't need to be removed often, you may find that when you tuck them away in a self storage unit you have taken a very practical step toward keeping your home free of clutter. Trim bushes, aerate the lawn, lay down fresh mulch, maybe even plant a few flowers. Garden tools can be bundled together and placed in trash barrels in your self storage unit when they are not needed. Spring cleaning may be a lot of work, but the payoff is a brighter, safer home. That can give you a new perspective and prepare you to meet life's other challenges. To find self storage facilities for your bulky out-of-season gear, tools, and other odds and ends or to protect your goods for a few days while the house is in upheaval, use StorageFront.